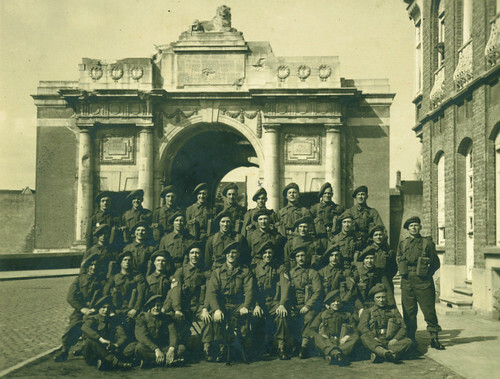 Following the landings on D-Day and the subsequent breakout from Normandy, the British and Commonwealth troops from 21st Army Group found themselves crossing the Somme in early September 1944 and on the battlefields of their fathers’ war. One remarked that they crossed ground in hours that had consumed the previous generation for four years. 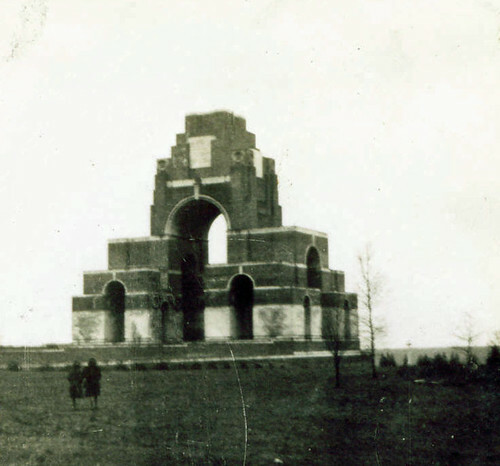 This photograph of the Thiepval Memorial was taken by a Royal Engineers officer in September 1944 who arrived in Thiepval and went to look at the memorial in the company of a couple of local French girls who appear in the image. The memorials looks sad and desolate, but undamaged. No flag poles, no flags or wreaths, but it was still there as the Somme beacon it had become following its construction in 1932. The same officer also went up the nearby Ulster Tower and photographed the Thiepval battlefield from the viewing platform on the top. It gives a rare insight into what the Somme battlefields looked like at this time. Thiepval Wood and Connaught Cemetery are visible to the right, with the memorial on the skyline. In the years that followed 1940 most of mainland Europe was occupying by German forces. Many of the German soldiers forming part of this occupying force stayed for years. On the battlefields of the old Western Front, German serviceman whose fathers had no doubt been veterans of the Great War often toured sites and with a pocket camera recorded their journeys in the same pilgrims past and present did. 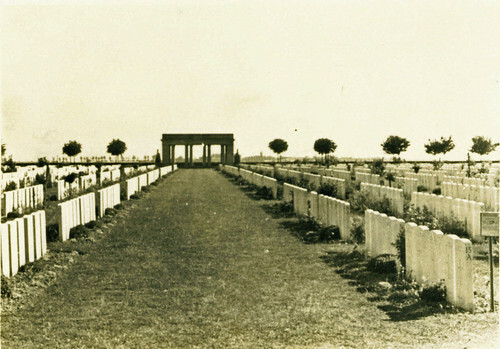 This photograph was taken by a German soldier in 1943 and shows Caterpillar Valley Cemetery near Longueval on the Somme. 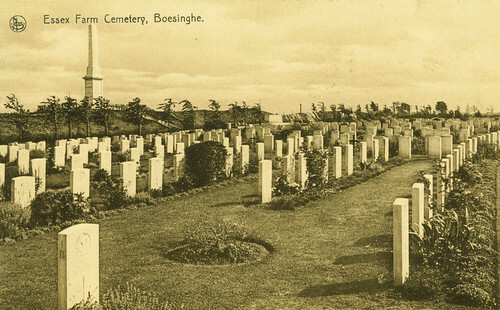 Many wonder what the cemeteries looked like during the occupation and it is clear from this image that this was a site being well maintained; many Imperial War Graves Commission gardeners had stayed behind in 1940 and were still doing their pre-war work. In some cases local French people were carrying on with the task. The Germans appear to have let the work continue. This cemetery took on another importance in 1944 when it became the selected rendezvous point for any air crew shot down in the Amiens Prison Raid in 1944. 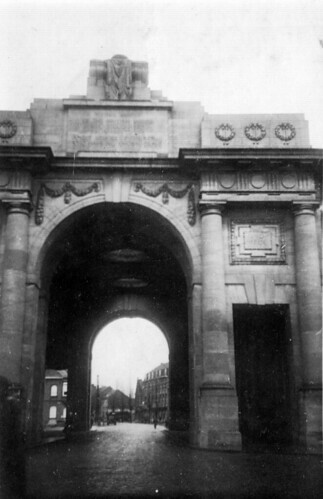 Conflict had revolved in and around the Flemish city of Ypres for centuries. During the Great War it was laid-waste by four years of bombardments and this once ‘medieval gem’ was reduced to rubble. Rebuilt using the original plans in the 1920s and 30s, the city had literally risen from the dust. Life had returned to normal and the beauty of the city had been restored, although some buildings like the Cloth Hall had not entirely been finished by 1939. It is hard for us to imagine what the people of Ypres must have felt therefore when war ravaged the city once more in May 1940. 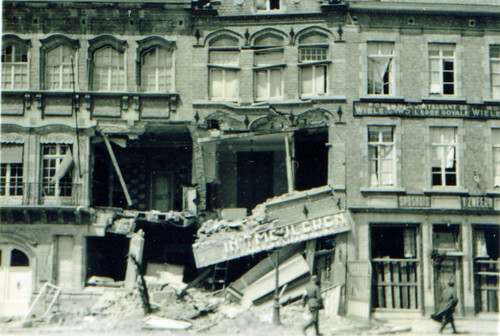 As fighting took place around Ypres between British and German forces, shells landed in the city centre. Buildings were not being particularly targeted but troop movements drew shell-fire, just as they had done in the Great War. And as such shells struck the buildings where those movements were taking place. 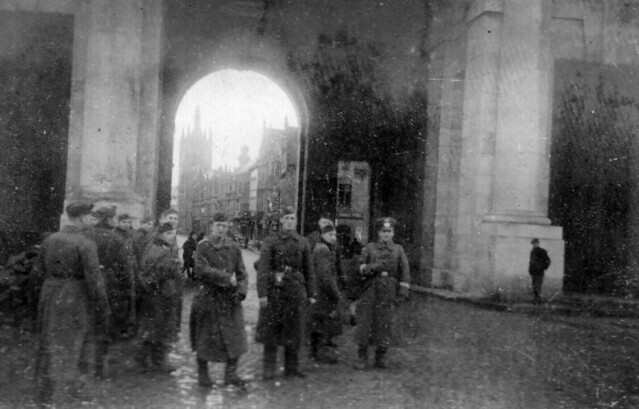 This image was taken by a German soldier just after his unit entered Ypres in May 1940. 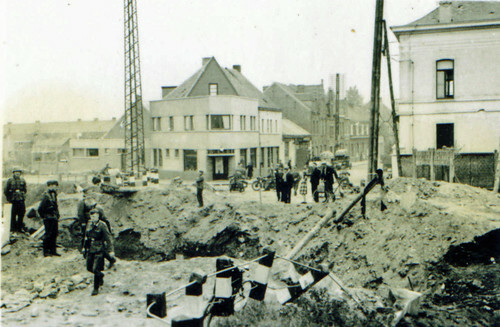 It shows the north side of the main square with the Hotel t’Zweerd on the right and a building that today is a bank. It is typical of some of the punishment meted out to Ypres at this time. Below the same German soldier photographed the exit from Ypres towards Poperinghe, which in WW1 had been ‘Bridge Number 10’. The moat bridge over the Ypres-Comines canal had been blown by British engineers, leaving quite a mess.